APPEARANCE: Hazy gold beflecked with orange highlights. Pretty. HEAD: Bright white. Fades appropriately. 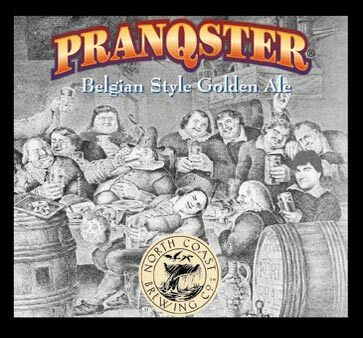 NOSE: The Pranqster would be an excellent gateway beer for Aleheads with some misgivings towards Belgian brews. It has all of the accessible aromas of a Belgian Pale Ale…sweet and tart, citrus and spice, vanilla and apricot….but none of the more challenging aspects like the funky mustiness, or banana esters. One of the more aromatic and pleasant noses out there. TASTE: Peppery and tart upon first sip with sugar and vanilla coming up in the middle. There’s a faint wisp of bitterness in the finish hinting at the somewhat strong alcohol content, but not enough to impede the enjoyability of the brew at all. A complex, but easy-drinking beer. MOUTHFEEL: Light, refreshing, effervescent, but with enough alcohol bite to remind you that this is a well-crafted, high-gravity beer. DRINKABILITY: Very high for the style. Actually, very high in general. A sixer of these would go very fast. RATING: I have a tendency to overrate North Coast’s offerings. It’s one of those breweries I can’t judge objectively…like Founders, Deschutes, Allagash and Terrapin. Wish I could say that bad habit will change here, but it won’t. 3.5 Hops. Posted in Tasting Notes.Tagged Belgian Pale Ale, North Coast, Pranqster. I love me some Northcoast. I agree with the 3.5, excellent brew with very high drinkability.